Trinity United Brethren in Christ Church occupies a building originally built in 1903 by Trinity Evangelical & Reformed Church, which was organized in 1874 as an offshoot of the present Zion United Church of Christ. In smaller communities and rural areas, German Lutheran and German Reformed congregations often shared the same building. It is unclear whether this building was shared with Zion Lutheran Church, however, in 1911 Rev. 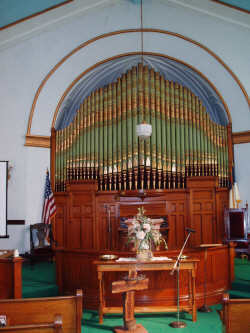 W. T. Grommisch was appointed pastor of that congregation and placed the order for this pipe organ, installed in the same year. His name and “Zion Lutheran Church, St Joseph, Mo” are stenciled on a board behind the organ case, which was probably part of the original shipping crates, the lumber from which was often re-used for internal structural supports and Swell shades. The Industrial Revolution of the nineteenth century and the availability of municipal utilities brought about considerable mechanical innovation in American organbuilding at the turn of the twentieth century, particularly in the application of electricity to organ winding and action. Many organbuilders, particularly those who catered to small, rural churches, such as Hinners and Kilgen, continued to offer mechanical or tracker action instruments in their smaller installations, which sometimes omitted temperamental reed stops from the specification. The “Peifer Pipe Organ” was built by Gustav Treu (pronounced Troy), who was born in Eschbach, Germany in 1871, and moved to St. Louis in 1888, where he worked for the highly regarded organbuilding firm of J. G. Pfeffer & Son, until taking over Henry Jaschke’s small organbuilding business in 1905. After his death in 1931, his son, daughter in law and grandson continued to operate a pipe organ service company until the mid-1960’s. Treu’s early instruments, few of which survive, were primarily small one and two manual tracker action organs, like the Peifer Pipe Organ, and were sold within a twelve state region. 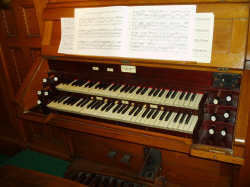 One distinguishing feature of Treu organ is the inclusion of a Great Octave Coupler provided a more brilliant principal chorus than was typically found on small tracker pipe organs of the time. 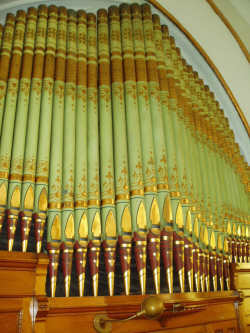 The Peifer organ’s tracker action and the flowing polychromatic stenciled design on the pipes, are a throwback to mid-to-late nineteenth century design. It is winded by the original forge blower, which were sometimes used until fan turbine organ blowers became more common. In 1961, the Trinity congregation voted to disband and unite with two other congregations to form the present Faith United Church. The building was acquired in 1962 by the United Brethren in Christ Church of South St. Joseph, which assumed the Trinity name. In 1981, Samuel Lucas, a local organist, inquired about the organ and arranged for Michael Quimby, owner of Quimby Pipe Organs, Inc. of Warrensburg, Missouri, to undertake minor restoration and repairs. In September 1982, twenty church volunteers assisted Messrs. Lucas, Quimby, and his assistant, Leo Endel, in washing pipework and cleaning the organ chamber. The organ was rededicated on April 1983 and has not received any major repair or restoration work since then, except for recent tuning and repair of the note actions controlling 30 speaking pipes in the case. The 340th Historic Organ Citation issued since 1975 was conferred on this organ by the Organ Historical Society, headquartered in Richmond, Virginia. A certificate was presented to the congregation, in conjunction with a recital by AGO Chapter members on March 12, 2006. This is the first Treu organ to be cited. Unfortunately, there are very few extant examples of his work. Polychromatic stencil designs that flow across the entire pipe fence were popular during the mid-to-late nineteenth century.